A cell phone or an educational tool? Cell phone use at our middle and high schools is creating a distraction from learning. I’d like to say this is our students’ problem, but it’s actually teacher cell phone use! I expect teachers to model good cell phone protocol when it comes to school. But, who wants to monitor everyone’s use of them? I also don’t want to take them away. Is there any common ground here? Basically, how can I make sure teachers are teaching instead of being on their phones? Are your teachers really using their cell phones during instructional time? In some ways, this seems like a really clear issue. If staff are using their phones in inappropriate ways during their work time, the consequences should follow your standard escalating disciplinary system. Where it gets muddy is determining whether the usage is inappropriate. I’ve worked in buildings where classroom phones don’t work properly and teachers have had to use their phones to reach each other and the office throughout the school day. Sometimes school support staff text each other so their sharing of vital information doesn’t interrupt student interaction with material. Many people use similar tactics during IEP or staff meetings. My point is that our phones are obviously phones, but they’re also tools, and your staff are trained professionals. 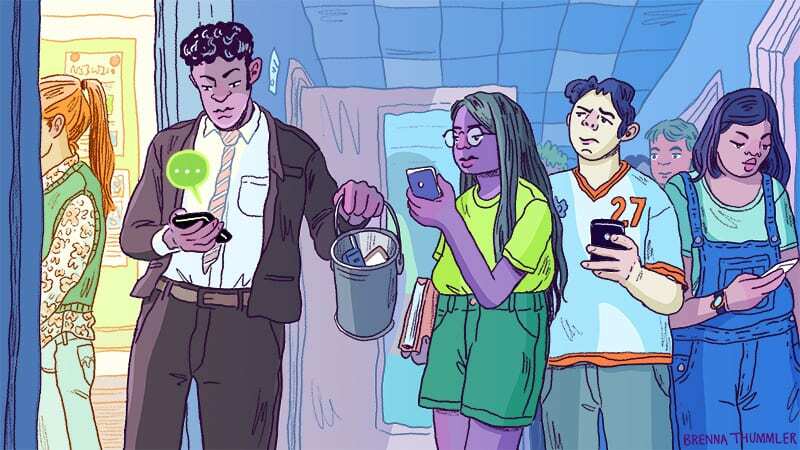 Smartphones have saturated our culture and, especially for staff in their thirties and younger, phones are the instinctual first step for solving problems. Is your speech pathologist using an app to determine whether her student would benefit from that additional support? Is your tenth grade history teacher looking for an instructional video while she’s proctoring an exam because her students are finishing earlier than she’d thought? Or is your seventh grade teacher calling to schedule a dentist appointment in the middle of a geometry lesson? Taking personal property away from adults is not a solution. Part of finding a real solution is obtaining answers to the above questions. Without context, acceptable behavior can seem inappropriate. Taking sweeping disciplinary action without first asking why can also destroy goodwill among your staff. Increasing teacher access to technology may eliminate some usage. If your adware is blocking a website like Instagram, your teachers are going to find a way around it, and that’s probably going to involve a cell phone. When teachers are using social media to teach students, it can be very educational. Regardless of the reasons, it’s worth having a general conversation at a staff meeting about appropriate and inappropriate usage and following up individually with people you’ve witnessed using their phones during class time. And by all means, if anyone on your staff is kicked back with their feet up playing Candy Crush on the clock, do what you need to.